Are you thinking of selling or renting your home? 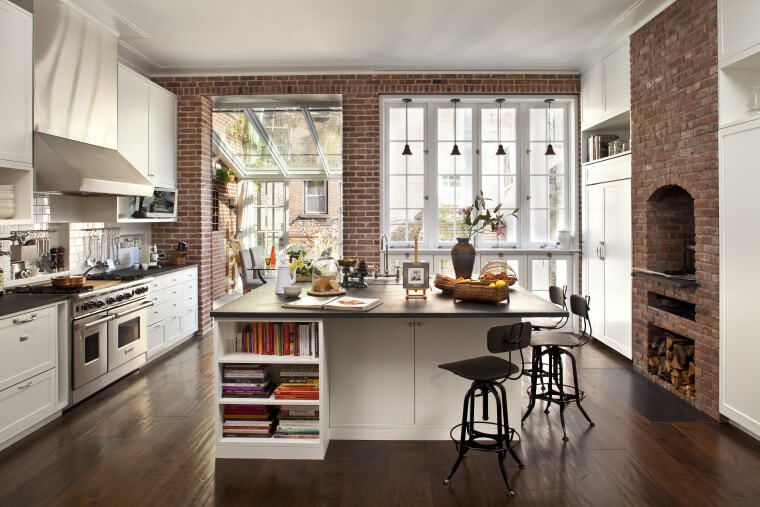 Before you do, making a few small changes to your kitchen can make all the difference to your home's value. "Never skimp on the kitchen. It's the first thing most people look at and comment on when they're buying a home. Real estate agents universally agree that it is the most important space in the house and can often dictate the value of the home," say GJ Gardner Homes. It might seem insignificant, but updating hardware such as handles and taps can really make a difference to your kitchen's appearance. Take the above image – slick metallic hardware complements the large industrial lights overhead. The combination of dark earthy textures, clean whites, interesting prints and metallic hardware establish this kitchen's modernity. 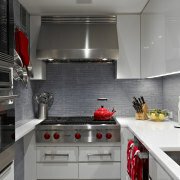 Or eliminate hardware and go handle-less to achieve a really minimal and modern look. 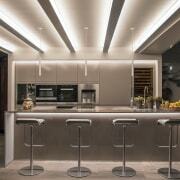 This sleek, modern kitchen uses Atom Spotlights by DOMUS LINE from FIT, pendant lights and natural lighting. 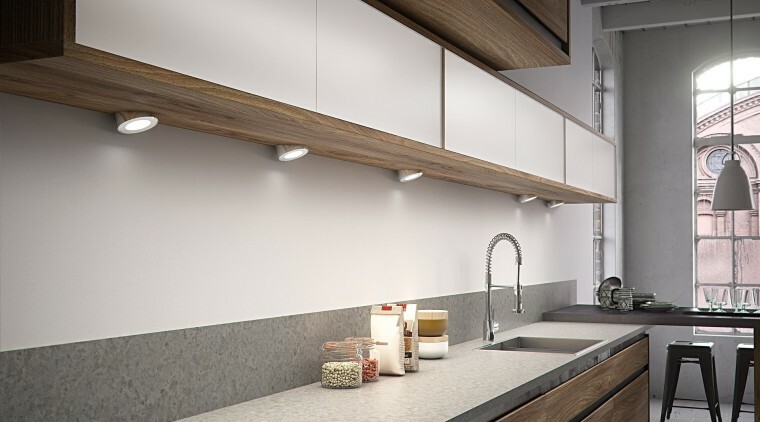 We all know fluorescent lighting does no-one any favours – same goes for your kitchen. It's an easy change too, just switch out the lightbulb. 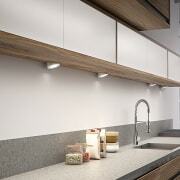 A functional combination of ambient and task lighting will create a softer, more modern atmosphere in your kitchen. 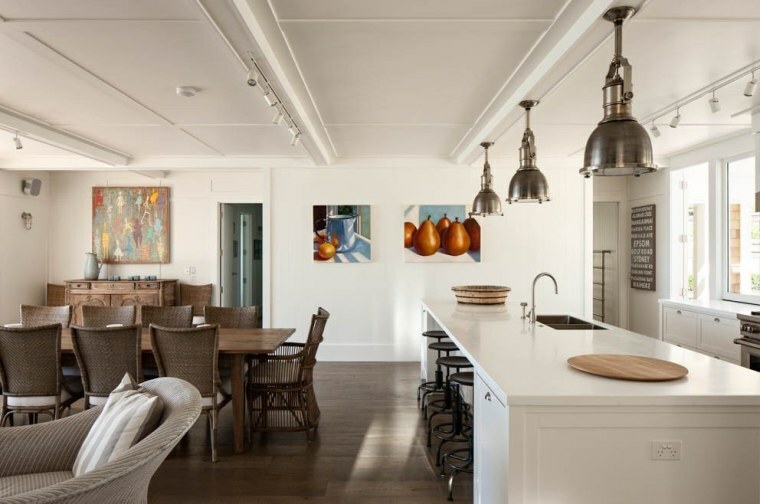 If your kitchen has less access to natural light, turn up the ambient lighting. 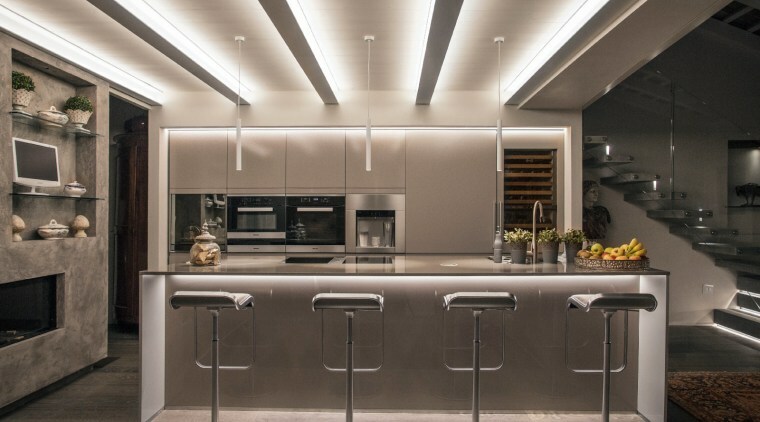 Having good access to light, real or artificial, can make all the difference to a kitchen – and by extension your home's value. 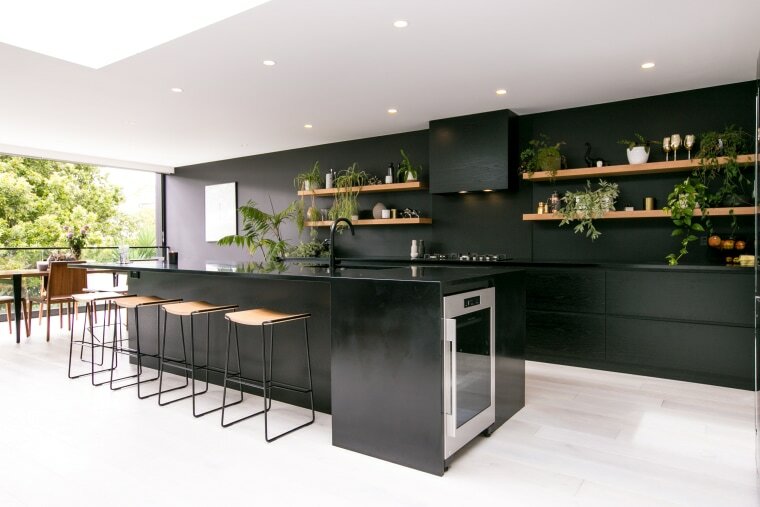 The walls of this kitchen are finished with Resene Nero, to achieve a chic look. It's surprising what a difference a layer of paint or sheet of wallpaper can make. Both are low-commitment options that you can easily change when the time comes. It's not just walls either, if you have older wooden cabinets a layer of paint can help to update them. 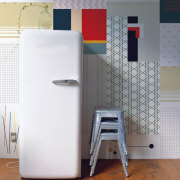 Cut and paste wallpaper is an easy way to embellish and overhaul your walls. 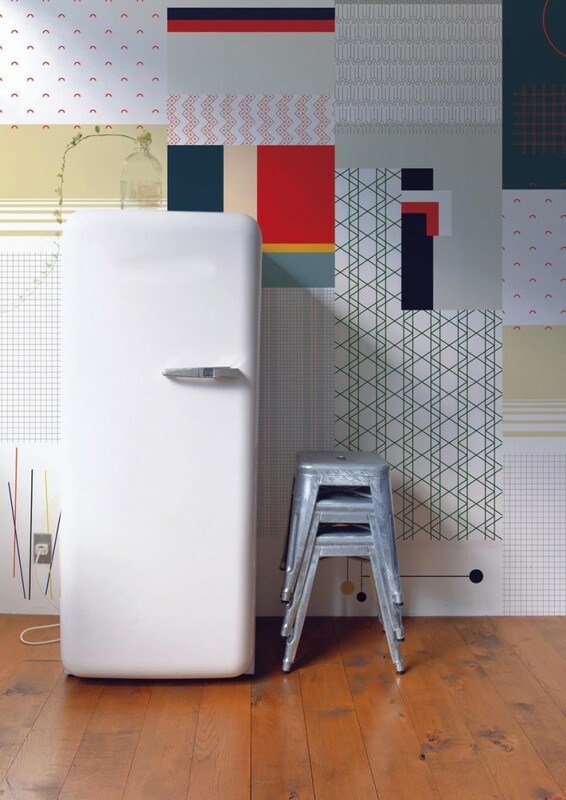 You don't have to be an expert to hang wallpaper, there are plenty of options for first-timers. 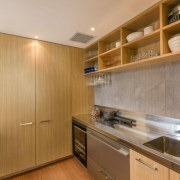 Open cabinets by R H Cabinetmakers add more functionality to your kitchen. 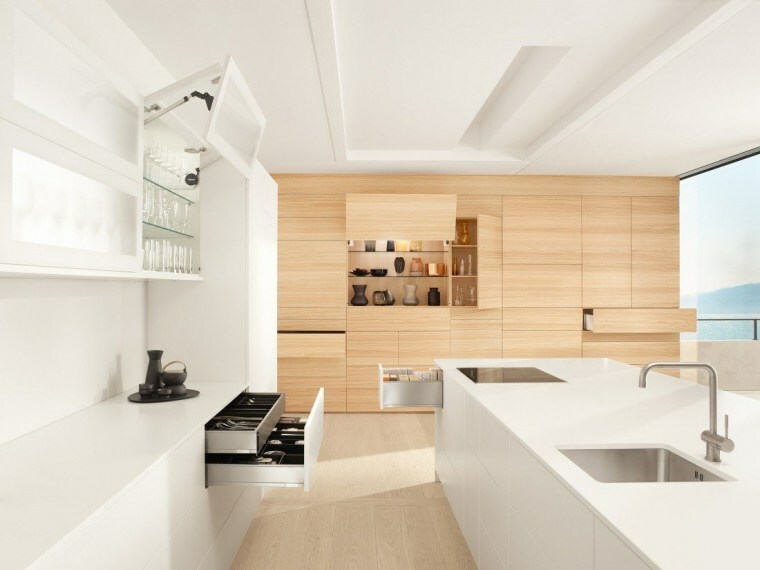 One staple of older kitchens is built-in cabinetry. 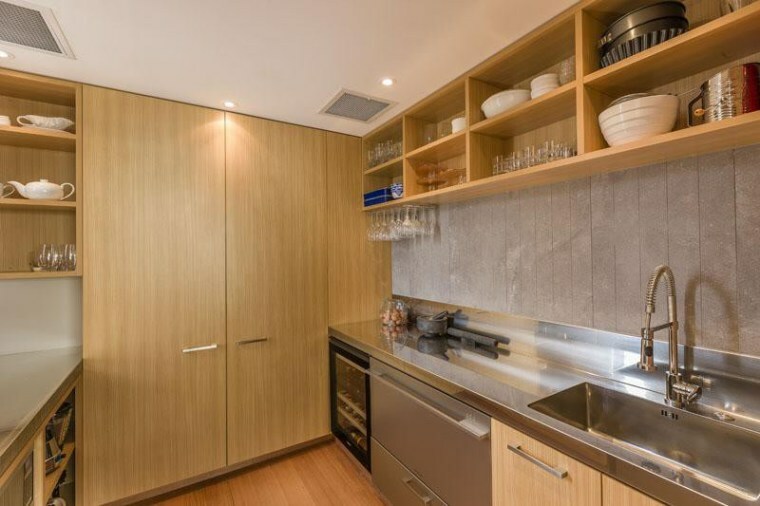 Upper cabinets can take up a lot of space making the kitchen feel cluttered and dated. 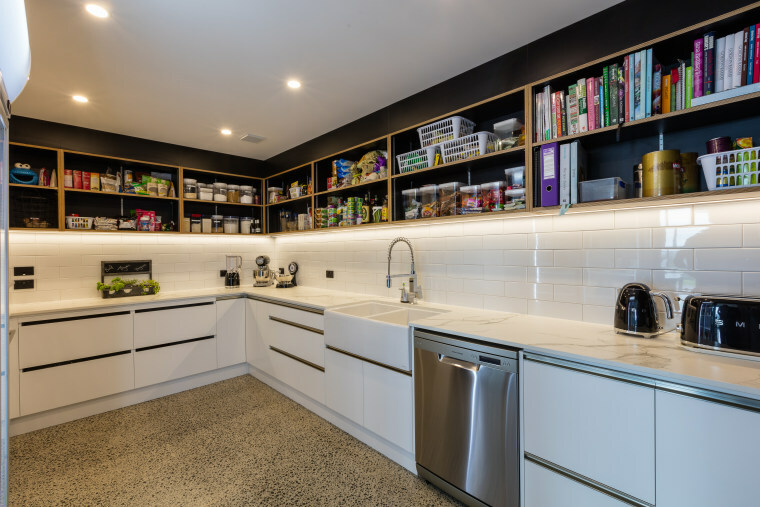 Open cabinets allow for easy access – keeping your most used kitchenware within arms reach improves convenience. Lots of food, cook books and other miscellaneous items are held in this scullery's open cabinets. 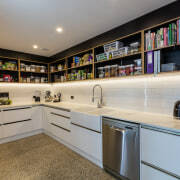 Not only do open cabinets create a more modern-looking kitchen, they increase your storage capabilities too. 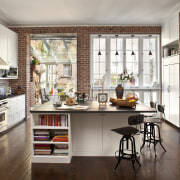 The kitchen in this home has an eclectic mix of accessories to modernise and make it feel lived-in. 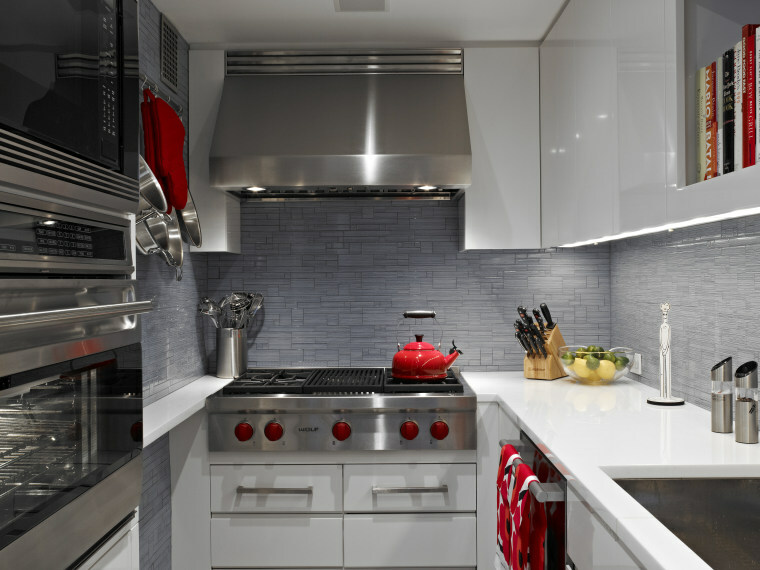 A few red accessories really pop in contrast to this neutral kitchen. We hope you've found this helpful. 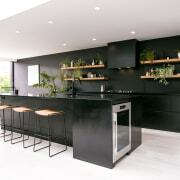 Now go and give your kitchen the contemporary overhaul it desperately deserves!